Here are some general pictures taken around the Jacob Javits Center, where PC Expo 99 was held. Not much going on outside PC Expo on Monday night, but wait until PC Expo opens tomorrow on June 22nd, 1999. Advertisers placed their signs everywhere. 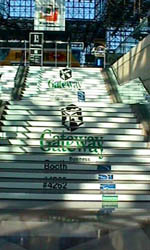 Gateway 2000 placed these signs on the EDGE of stairs. Unique location! There were so many things to see at the show during the three days (June 22-24, 1999) of the event.